We manufacture high quality custom apparel, accessories and patches in small batches and with fast turnaround. Choose from our stock items or let us manufacture it from scratch. Custom apparel manufacturing. Made easy. We have a huge variety of stock fashion apparel and accessories that can be fully customized and manufactured instanstly. Easily design a full fashion-line for your brand with our expert help to speed up the process. Choose an item from our online stock inventory and customize it instantly with our advanced product yet easy-to-use designer. Want your clothing or accessories made fully by your specification? Shoot us a quote request and get all the info within a day. Keep your investments low with On-Demand Manufacturing, get products manufactured when you have sold and with no MOQ's. Follow us on instagram and get exclusive offers and the latest news. High-end custom printed apparel: shirts, hoodies, patches and a lot more. RAW&SILK offers a huge variety of print customizable products to choose from. Design your very own high quality custom printed t-shirts, hoodies, crewnecks, sweatshirts, tanktops. Designing printed apparel has never been easier! 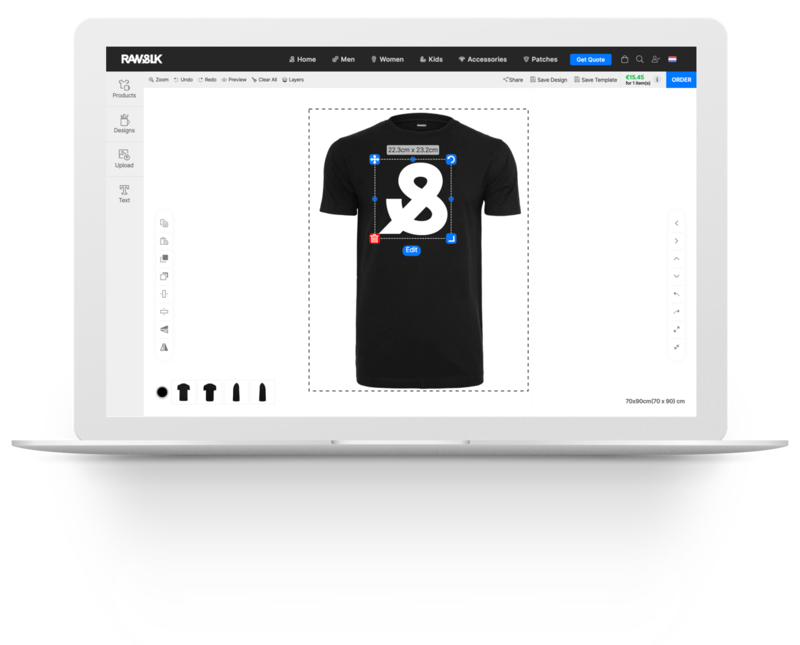 Thanks to our advanced Product Designer you’ll be able to personalize the choosen custom printed product with your own text, images and designs. Having a hard time coming up with a suitable design for your tee, hoodie, snapback, hat or beanie? We’ve got your back! Choose from our wide selection of unique stock graphics, mix, match and combine them to create your personalized, custom printed design. With over a 100 of unique customizeable products available for all your design and printing needs, you’ll sure to find something for yourself or your beloved ones. Personalized and custom printed apparel makes for a great gift for family and friends! Looking to order a larger quantity of custom printed clothing? Be sure to send us a Quote Request so that we can adjust the prices for you accordingly! Let us know what you’d like to see changed, we’re able to deliver custom printed apparel and other items on demand. Manufacturing customer specific high quality clothing with your own logo or simply a white label isn’t the slightest problem for us. Our customer service will gladly answer all your design, print, apparel and product related questions. Haven’t found anything you’d like to get custom printed? Shoot us a message in the chat! We’re expanding our product range on a daily basis, adding brand new customizeable tee’s, bags, backpacks, mousepads, keychains, patches, hoodies, casual and sleeveless shirts, tanktops, workwear, accessories, baby bibs and bodysuits, kids clothing, caps, beanies crew necks, oversized sweaters and much more!